I finished the novel Twilight in a day. 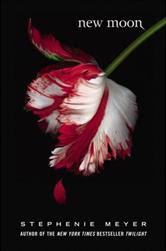 The next day, Monday, I started on the second book of the Twilight Saga, New Moon. I was definitely hooked on Edward Cullen. I felt giddy and excited with all the trashy-romantic-vamparish-supernatural thingy. I felt like 17 for goodness sakes! I just can't put the book down not because the writing style and plot of the author was excellent (far from it) but because the author was able to project a larger than life vampire-human love story. If Edward Cullen was a real vampire in the real world, reading the book would make you want to be Edward's girlfriend, or for that matter- his destiny. Isabella "Bella" Swan is thrown an eighteenth birthday party by Alice and Edward Cullen, the vampire she loves, and the rest of their vampire family. While unwrapping a gift, she receives a paper cut. Jasper, the newest member of the family to attempt a non-human diet, tries to attack Bella, overwhelmed by the scent of blood. In an attempt to keep Bella safe from the world of vampires, Edward and his family leave the small town of Forks. Bella enters a deep depression and seeks comfort with Jacob Black, an old family friend who clears the haze of Bella's pain. Bella and Jacob spend more and more time together, and Bella soon discovers that the rush of adrenaline present when she places herself in dangerous situations stimulates a hallucination of Edward's voice. Bella begins seeking out dangerous behaviour, such as motorcycle riding, to keep Edward's voice with her. Meanwhile, Jacob finds out that he is a werewolf. Initially, he tries to keep this secret from Bella, but he eventually reveals as much as he can without betraying his pack. After Bella attempts cliff-jumping, she gets caught in a riptide and is rescued by Jacob. At the same time, Alice Cullen, Edward's vampire "sister" who has visions of the future, has a vision of Bella jumping. However, werewolves are one flaw in her ability, and she does not see Jacob rescuing Bella. Presuming Bella is dead, Alice rushes to Forks to check on Charlie, Bella's father, while Edward calls Bella's home. Jacob picks up and informs Edward that Charlie is "at the funeral", referring to that of a man in town who had a heart attack, but Edward draws the conclusion that it is Bella's funeral. Desperate after Bella's supposed death, Edward flees to Italy to see the Volturi, peace-keeping vampires who would be able to kill Edward, granting him leave of a world without Bella. Bella and Alice rush to Italy to stop Edward, and save him before it is too late. Before they leave Italy, the Volturi tell them that Bella, a human who knows of the existence of vampires, must either be killed or changed into a vampire herself. After they return to Forks, Edward explains to Bella that he only left in order to protect her, and she forgives him. The book ends with the Cullens voting in favor of Bella being changed into a vampire, much to Edward's dismay. hi ate lena! done with your request. can i have your email add?